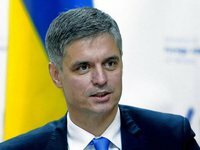 Hungary continues to block meetings of the Ukraine-NATO Commission with the aim of pressuring Ukraine to repeal its law "On Education," Ukraine's Ambassador to NATO Vadym Prystaiko has said. "Hungary's goal is to put pressure on weak points" until we abandon the implementation of the law "On Education." Indeed, the meetings of the Ukraine-NATO are blocked above the ambassador level. This is a serious political problem in our relations with NATO. We are working on its solution," Prystaiko said in an interview with the Kyiv-based Interfax-Ukraine news agency. Prystaiko said Ukraine's NATO partners explain to Hungary that the issue of the language of education should be returned to the bilateral format. "The position of Hungarian Foreign Minister Péter Szijjártóis supported by top Hungarian politicians. Hungary is abusing the principle of consensus in NATO," the diplomat added. Prystaiko said Ukraine's Foreign Minister of Ukraine Pavlo Klimkin, had already received an invitation to participate in the meeting of the foreign ministers of the contributing countries of NATO's "Resolute Support" mission in Afghanistan," which will be held on December 4-5.